Ever wonder how these successful brands grew from 0 to millions of users? These brands don’t have magical powers. But they’re smart enough to know that to forever grow their tribe, they need to craft the best message that’ll spread like wildfire. I’m talking about viral marketing. A viral marketing campaign is also the perfect means of increasing your email subscriber list overnight. In this post, I will teach you how to craft a campaign from start to finish using viral marketing ideas while incorporating the three key steps I just mentioned. The first phase of your campaign is deciding what you want people to do to win your incentive. Step 1: Enter their email. Step 2: Invite their friends to sign-up. Why not ask prospects to join your FB group? Use this group to demonstrate your expertise after people have entered your campaign. Ask them to follow your Twitter account. Once you’ve grown a good number of Twitter followers, you can leverage that follower base to effortlessly run Twitter contests in the future. Giveaways are a way to instantly increase your YouTube subscribers without buying them. If your YouTube channel needs traction, then definitely require people to subscribe. If you got a new blog, increase your readership by asking people to write thoughtful comments on one of your posts. Without incentives, it would be next to impossible to enlist participation from your audience. Don’t just offer any reward; make sure that it matches your buyer’s persona. Use prizes not only to draw more people into signing up but also to grow a high-quality subscriber list. Here are a few viral marketing ideas for prizes to get you started. Giving out coupon codes may be a common practice among businesses but it sure triggers sign-ups – not to mention product awareness and sales. 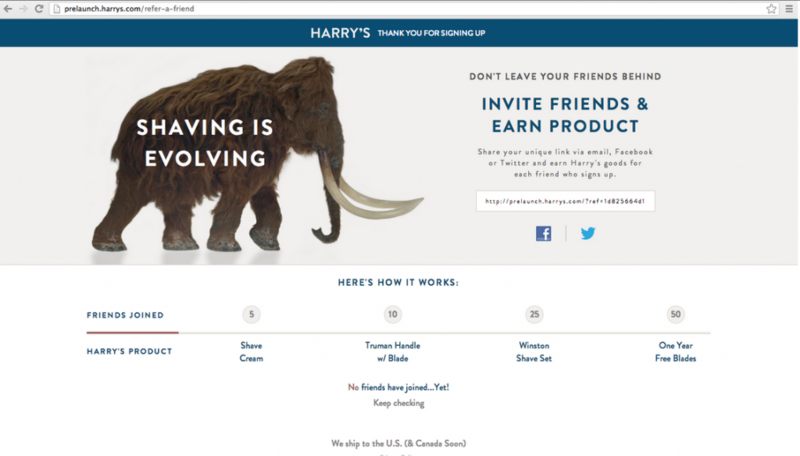 The shaving startup brand Harry’s successfully gathered 100,000 emails in one week (even before launching) through a referral campaign. The giveaway prize? Their very own shaving products. To Harry’s founders, it didn’t matter that they were a startup. They knew that their own product would make the best reward because it would build brand advocates. If you happen to have a service-based business, then offer that service as a prize. That could be a one-on-one consultation or training. What’s one thing that your audience would love to get that they would consider a once-in-a-lifetime opportunity? Make them feel like they’re winning the lottery. Your prize could be a trip, salon makeover, or VIP tickets. Not only is this viral competition prize affordable, but it’s also a brilliant way to create influencers out of customers. 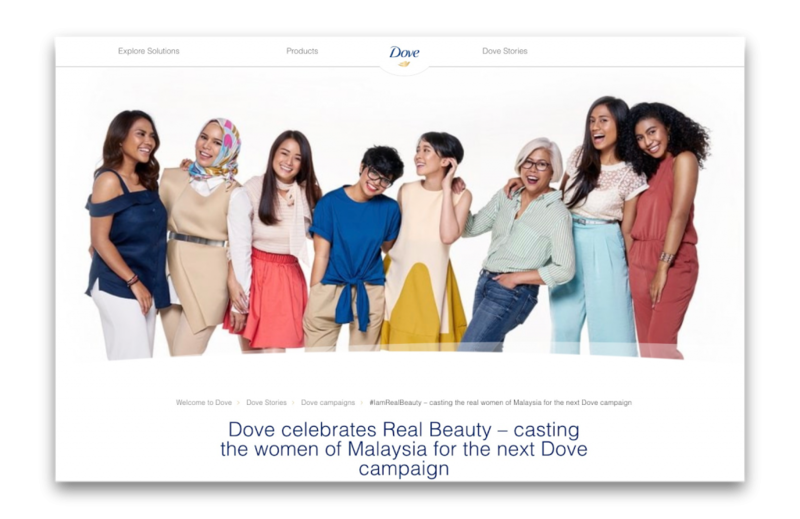 Dove celebrates Malaysia’s 60th National Day by offering campaign participants a chance to be featured in their next campaign. An opportunity to enjoy free stuff for half a year is something that people cannot resist. Choose goodies that are related to your brand. If you sell food and drinks, use them as your campaign giveaways. Check out 41 creatives and small prizes for different industries. Landing page optimization is an essential step to maximizing the viral potential of your campaign. You can have the best viral marketing ideas but still, fail at your landing page. We’re hardwired to pay attention to videos because they use the element of storytelling. Your explainer video should tell people why they would want your incentive and how they can get it. Add social media buttons that would make it easy for your prospects to get the word out and get their friends to sign-up as for more chances of winning your incentive. Let participants of your campaign know where they stand. A leaderboard shows their current rankings. For example, if your campaign requires that a person has to get 100 points to win, the leaderboard shows all the points participants have acquired so far, starting with the participant that has the most points. When people see their current status, they feel more motivated to keep sharing your campaign until they unlock the reward. If everyone else likes your prize, prospects have a good reason to like it too. That’s how social proof works. Skeptical people will have their worries eased and potential fans will feel the excitement of winning. Select a few people to become your “ tasters or testers” so they can provide real testimonials for you, in case you don’t have customers yet. Now it’s time to explore viral marketing ideas to promote your email list building giveaway campaign. A basic method is to share your campaign with your social media followers. Create an awesome blog post that announces your contest. Include all the details of the contest and links to the campaign page. This ensures that your blog visitors see it. You can also promote the post on online communities you’re part of. Consider reaching out to bloggers and influencers through email to ask if they’d be interested in helping with the contest promotion. Incentivize them. Only work with those in the same niche.